Gypsum boards have become popular lately. Everyone likes to give their home a different look by installing false ceilings or create pseudo rooms by placing a drywall. The demand for gypsum ceiling and interior workers is increasing day by day. Well, we understand your needs and have a team of drywall workers so skilled you’ll have a hard time finding fault with their work. Well-trained experienced and licensed, our workers are the best at doing what they do in all of Bahrain, we provide the best gypsum services. Our professionals will create a drywall ceiling for you or repair existing ones. From water damage to termite corrosion, our workers know how to handle it. 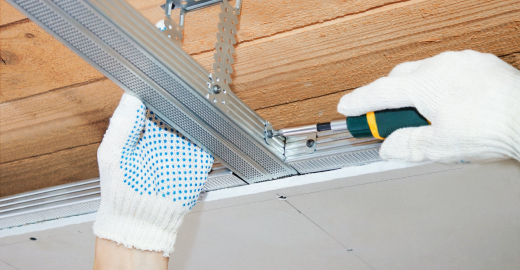 Whether ceilings or walls or anything else, our drywall experts will do it. And with a professional touch. Our professionals can even guide you on the best designs for your rooms to ensure the best lighting conditions. We regularly update our workers about the latest trends in design patterns and keep sharing information about the most recent projects undertaken so that our gypsum services remain the best. With our well-trained, qualified and licensed team, we promise satisfying excellent work. And any other gypsum/drywall service that might be needed. We take orders or appointments through phone (call on the number at the top) or via online bookings. Once we get an appointment order, our team will visit for the site inspection. Our experts will guide you about the places where to install, designs, sizes of the walls, etc. and once you’re convinced about the kind of work you want to be done, we’ll give you an estimate of the cost that would be incurred. We charge a nominal visiting fee that is waived off in case you decide to get the complete work done by us. Once you decide to give us the complete work order, our team will visit your place according to your convenience and after the work is completed upto your satisfaction, we’ll generate a detailed invoice with all the costs listed such as materials, labour, taxes, etc. and payment is collected along with your valuable feedback. Why is our Gypsum Service the Best in Bahrain? We employ professional gypsum workmen with extensive experience in their job. Our employees are all well-trained, responsible and licensed. We keep imparting new knowledge about any latest trends that are currently trending in the world. We share our experiences with each other, helping us to stay updated and improve our skills in the right direction. We constantly train our workmen to help them stay on the top of their skills and rise above the competition. We constantly long for betterment. That is what keeps us moving ahead. Our goal is to provide our customers the best service anyone can get. Installing drywalls and false ceilings is a tedious and mostly time-consuming. In today’s busy world, nobody has so much time to build a wall themselves. Also, without proper equipment, we may end up injuring ourselves and also, the construction might turn out to be inadequate for its intended purpose. A professional pair of hands will not only ensure the construction is done properly, but will also do it in such a way that it would be almost indistinguishable from actual walls of the building. A professional drywall worker will provide you the best advice and will also make sure the place looks better than before. We, at handyman, offer the best gypsum services in Bahrain. Our workmen are well-trained and licensed to perform all kinds of gypsum works in all of Bahrain. We provide false ceilings, interior walls, maintenance, repair, replacement services all over Bahrain. Handyman is available for calling in all days. We take bookings and appointments every day. You may book an appointment with our carpenters between 8AM-8PM on any day. You may call us for a planned visit or on an emergency. Choosing handyman is equivalent to choosing quality. We have the best workmen in Bahrain with proper experience and relevant certifications and licenses. Our workers are thoroughly professional with a knack for their job. You’ll never be disappointed with our service. Our commitment towards our work makes our drywall services the best in Bahrain. Gypsum, chemically known as Calcium Sulphate Dihydrate is a plastering material used to make false ceilings or interior walls. The gypsum is usually pressed between thick sheets of paper to make the plastering material; other additives make the walls/ceilings robust enough to be installed into the interiors. Gypsum walls have been very popular in the western countries for quite a while now and have been gaining popularity in the middle east lately including our nation. Drywall construction is easy to install, repair, maintain and replace as compared to conventional brick and concrete structures. However, gypsum plasters are not as durable and are intended for use indoors only. It has become a popular trend all over the world to have a false ceiling installed at your home or office/workplaces. Drywall ceilings can be constructed quickly, are easy to maintain and remove and can be designed in the fashion of your choice. In case, you don’t like the design after some time, it can also be replaced, unlike concrete ceilings. Our professional workmen will construct gypsum ceilings for you. We’ll make you ceilings the way you want. Also, we’ll take care of their repair and maintenance, all at your convenience. Our expert workmen can construct gypsum walls in your homes at your desired places, with the desired dimensions. We can build walls, demolish them, maintain them, repair any kind of damage taken by the walls or do any other work required to be done there. Leave that worry to us and enjoy your home with those plasterboard walls. Plaster walls are very brittle and can get damaged very easily. A strong hit and there is a large hole in the wall. Being just Calcium Sulphate sandwiched between two thick sheets of paper, drywall is also extremely vulnerable to water damage, fungus, termites, etc. Well, our workmen know how to take care of these problems very well. No matter what the issue is with your plaster over the place, our people are more than just capable of handling it.